The holidays can be a time of great love and fellowship with friends and family. It can be a glowing hearth of goodwill and cheer, of laughter and games, of gifting and cooking and toasting our loved ones. It can also be a time of great strife and awkwardness, of gritting our teeth and biting our tongues. It can be a laundry room where you slip away to chug whiskey and try not to think about the fact that your grandmother’s boyfriend just said you were fat. Perhaps you sneak away to shove entire chocolate doughnuts into your mouth while you imagine blissful silence. We’ve all been there. Most of us aren’t alone in this trade-off. The holidays giveth and the holidays taketh away. Recently, Bon Appetit magazine released this year’s Thanksgiving issue, complete with recipes and a turkey that purports to change your life and a full guide of what to do with leftovers. But this year, Bon Appetit also included a modern guide to Thanksgiving etiquette. I like writing thank you notes and showing up with hostess gifts and generally following rules of good manners, but I never sought out a guide on these things. I mostly just defer to my mother or my wife for guidance. So as I pored through Bon Appetit’s guide, I had a surprising revelation: etiquette might just set us free. I’m not talking about the kind of etiquette that prepares you for dining with the Queen, should you be invited. This isn’t about what fork to use or where to put your water glass so much as focusing on the human-to-human aspect of etiquette: the conversation, the approach, the length of our fuse. I like rules. If I can set a goal, and memorize some rules, then I feel like I’m in a game with myself. And if I can make it through an awkward gathering and follow the rules and win the game, I’m psyched. And I figured out that the game I might want to play – rather than planning out cogent political arguments or practicing my icy “be silent” stare – is the game of etiquette. The etiquette game is really a challenge of self-control and ebullience. It’s a game of reversals, redirecting the conversation in a positive, uplifting direction. It’s a game of generosity. I keep little nuggets of etiquette in my pocket these days. The game has extended beyond the borders of holiday gatherings and has branched out into all levels of social engagement. The game plays on. So here are a few books should you want to get into the etiquette game yourself – I’ve not read all of them, but they are books that speak to me for one reason or another, books I’d like to dig further into. 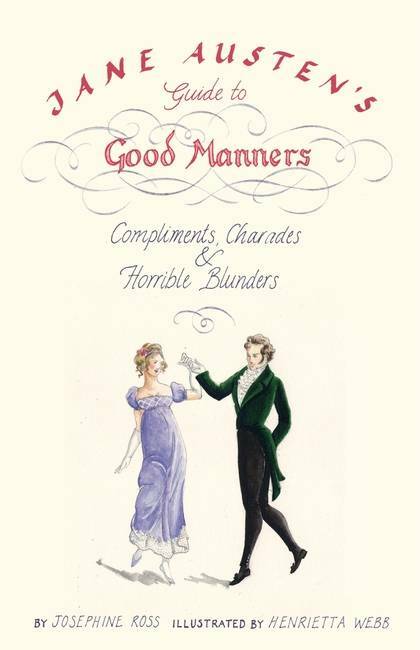 Jane Austen’s Guide to Good Manners by Josephine Ross. If you want a novelty book about manners then this is a fun book to page through. A cursory knowledge of Jane Austen’s major works will help you here, and this book illuminates the level to which manners are at play in Austen’s work. 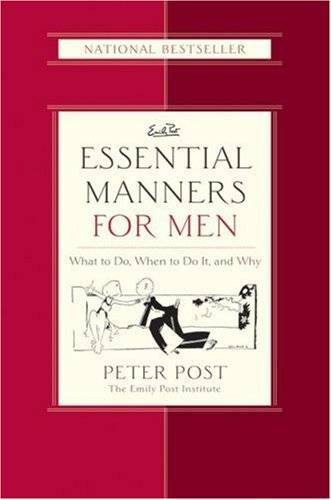 Emily Post’s Essential Manners for Men: What to Do, When to Do It, and Why by Peter Post. You know we have to have one book from The Emily Post Institute (that’s a real thing). Most etiquette books are written expressly for women and girls. This was one of two books I found for men, written by Emily Post’s great-grandson. 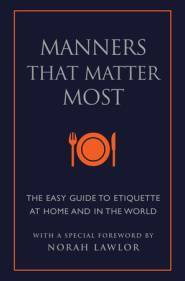 Based on lots of data gathered by the Institute, the book is conversational, practical, and openly acknowledges that gender bias so common with etiquette books. 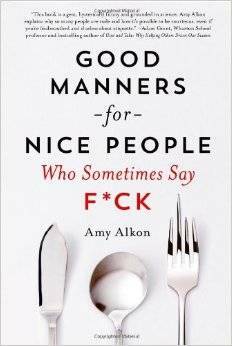 Good Manners for Nice People Who Sometimes Say F*ck by Amy Alkon. Out this July, this book is truly a contemporary look at manners, with an eye towards humor. I haven’t read this one yet, but I want to because, you know, it’s a book about good manners for people like me. Because here’s the thing: all this focus on manners and playing the game of etiquette and controlling situations with rules can build up a false expectation of perfection. But that’s not the goal. Manners isn’t about achieving perfection; manners is about achieving a mindset. That mindset is focused on doing no harm; it’s focused on goodness and kindness; it’s about focusing outward. No one will get it right every time. But that’s the beauty of the game. Sneak off to the laundry room, have your emergency doughnut, and get back in the game.